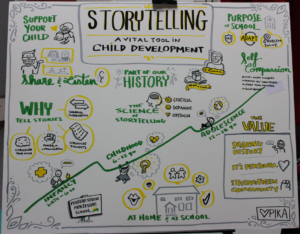 On Thursday, November 8, a group of MSMS parents and teachers met to learn about how storytelling supports child development. We talked about how parents can have intentional and strategic access to this powerful Montessori “material” and the wonderful side effect of this practice being that it supports strong relational bonds and real conversation. We were joined by Pika, a parent volunteer, who live drew the infographic pictured here as a means of capturing the highlights of the presentation. Storytelling is a uniquely human ability that has, through history, supported our sense of self, community, and history. The science of storytelling reveals that through the production of cortisol, dopamine, and oxytocin that the human brain connects to stories intellectually, personally, and socially. This makes it an amazing tool in helping us be able to adapt in our ever-changing world. Based on Dr. Montessori’s planes of development, children need to hear different types and lengths of stories. We focus on true stories and try to keep them as brief as possible to leave room for reflection and processing. It is a good rule of thumb that the younger the child, the shorter the story. Even stories for elementary students and adolescents need to be short enough to leave room for reflection, wonder, and curiosity. The importance of developing an oral tradition within your family does not have to be elaborate or complex. Starting with stories as simple as, “This is an apple. It is red.” and moving to a story about how you went shopping for apples supports a child’s awareness of the stories of our life. This tradition will continue as your child grows to include wonder (elementary) and a sense of self and civic awareness (adolescents). Telling stories about your life, your child’s life, and your shared experiences gives children a sense of place and also helps them to see their life as a story in process. This supports a growth mindset and the development of self-compassion and forgiveness. Oral telling storytelling helps children experience all elements of communication including eye-contact, vocabulary, tone, and inflection. It also allows us to focus their attention on certain aspects of the story and develop relational connections including trust and a feeling of being valued. How does screen time impact a child’s sense of story? What are some times you could easily add storytelling to your day? What stories could you tell your children?